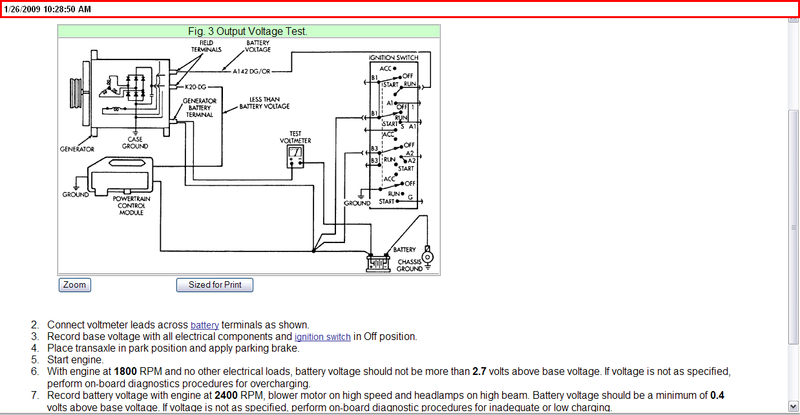 Technical Car Experts Answers everything you need: Charging system problem on Chrysler LHS car? Battery not holding charge.Car headlights flickering or getting dim. Starter not engaging or alternator not charging car battery. In this cases the car charging system needs to be tested. It should read low 14 or high 13 volts when it work right. The main components of the alternator are the rotor, stator, rectifier, end shields and drive pulley. Direct current is available at the output "B+" terminal. Alternator output is controlled by voltage regulator circuitry contained within the power and logic modules of the Engine Controller. The charging system is an integral part of the battery and starter systems. Since these systems work together, any diagnosis and testing should be done in conjunction. The charging system is protected by a 12 gauge fusible link located in the A11 circuit. The A11 circuit is connected to the battery feed BUS bar of the power distribution center. The generator is case-grounded through its attaching bracket. This generator uses a voltage regulator internal to the Powertrain Control module (PCM) . When the vehicle is running battery voltage is applied to the generator field terminal through the A142 circuit, on all engine applications. This circuit is controlled by the contact side of the Automatic Shut Down (ASD) relay. The ground, or voltage regulated side, of the generator field is controlled by the K20 circuit. Circuit K2O connects to cavity 4 of the PCM. When there is current present in the field, and the rotor is turning, the stator in the generator produces a B+ voltage that is supplied to the battery through the A11 circuit. The A11 circuit is connected to the output terminal of the generator and to the BUS bar in the PDC . Here some test for you. Complete test connections as shown. Remove air hose between engine controller and air cleaner. On non-turbocharged models, connect a suitable jumper wire from green (R3) terminal to ground. Do not connect blue J2 circuit to ground. On turbocharged models, connect a suitable jumper wire from green R3 leadwire on dash side of black 8 -way connector to ground. Do not connect blue J2 lead of 8 -way wiring connector to ground. On all models, connect battery ground cable, then start engine and operate at idle. Start engine and allow it to reach operating temperature. Clean all dirt and corrosion from a small spot on alternator housing. A/C heater blower switch to high. Connect the positive lead of a voltmeter with a millivolt scale to alternator housing attach negative lead of voltmeter to battery negative post. 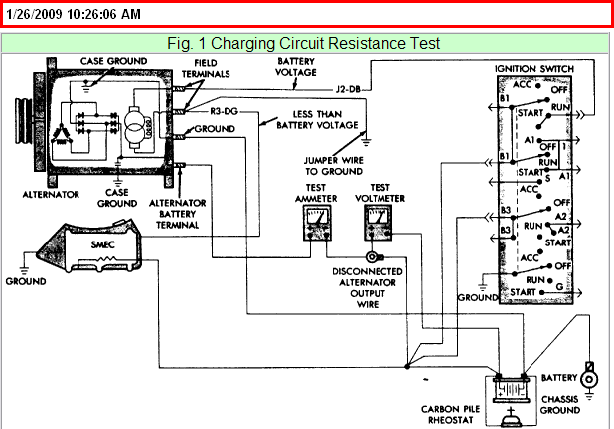 Check generator ground path using an ohmmeter. Resistance should not exceed .3 Mega ohms. Connect positive lead of an 18 volt voltmeter to positive lead for generator (B+) output terminal. Connect negative lead to positive battery post. Place transaxle in park position and apply parking brake. Start engine and allow to idle for ten minutes. Operate blower motor on high speed and turn headlamps on high beam. Increase engine speed to 2400 RPM and observe voltmeter. Voltmeter should not exceed 0.8 volts. If a higher voltage drop is indicated, clean and tighten all connections between generator and battery. If voltage drop is as specified, system is operating correctly.